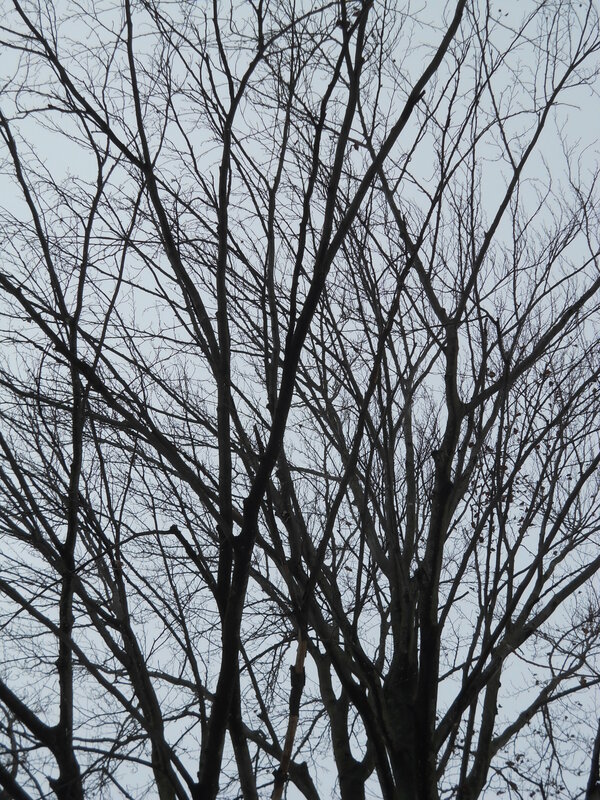 Bare branches define short day skies. Bring a lamp. Be prepared for dark nights. Advent stole made on speculation and available for purchase at fibergig. The new stoles for $75 are in our online shop, fibergig, at Etsy. 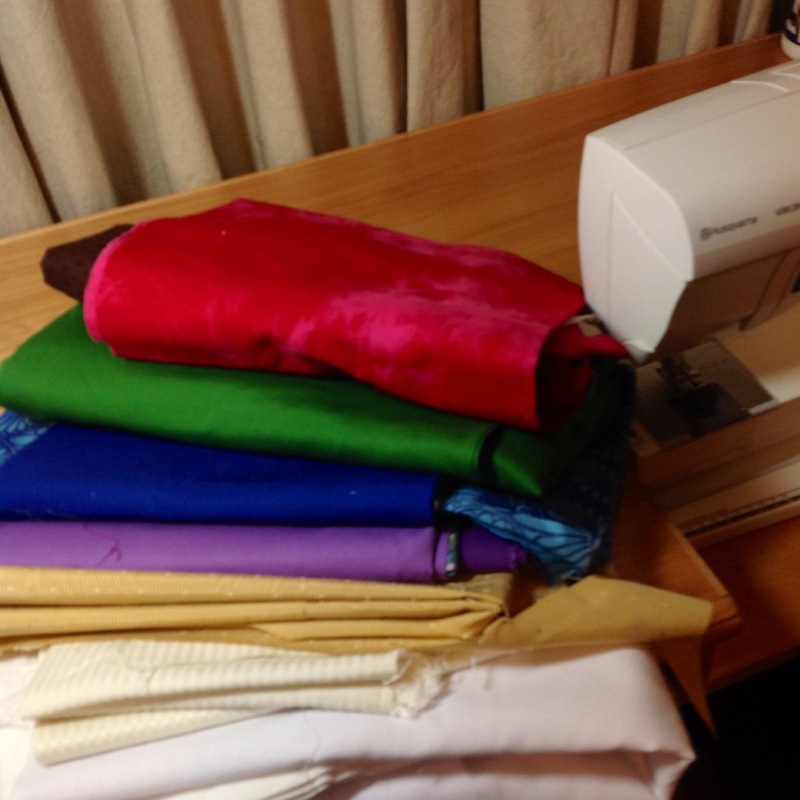 Starting point: stack of selected fabrics. Prepared for paint, stencils, and screen printing. Painted, ready for embellishment, highlights, lining. See our stoles at fibergig.etsy.com/shop. 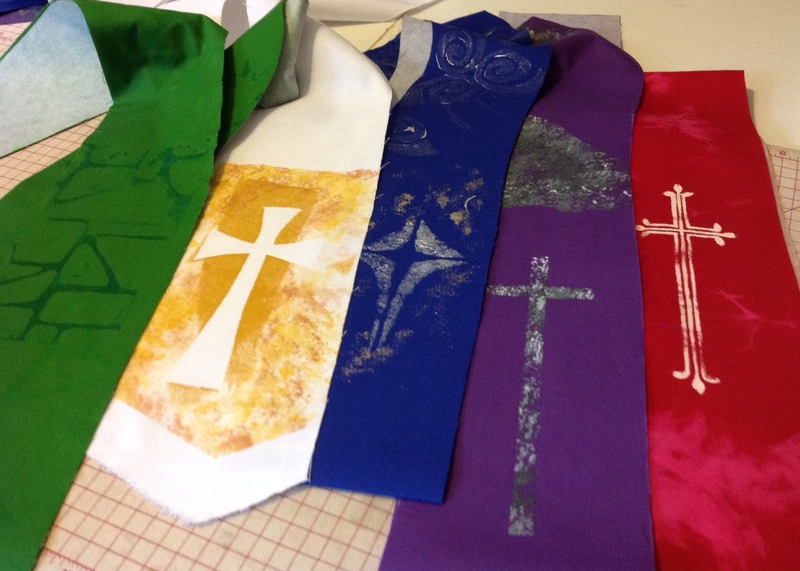 In mid-September I posted about my studio challenge to design one of a kind artistic stoles at a more modest price point than my current work. The solution must maintain the standards of construction that I use for the rest of my work. After I selected fabric from my inventory, I prepared each selection to be painted with an existing motif from my collection. 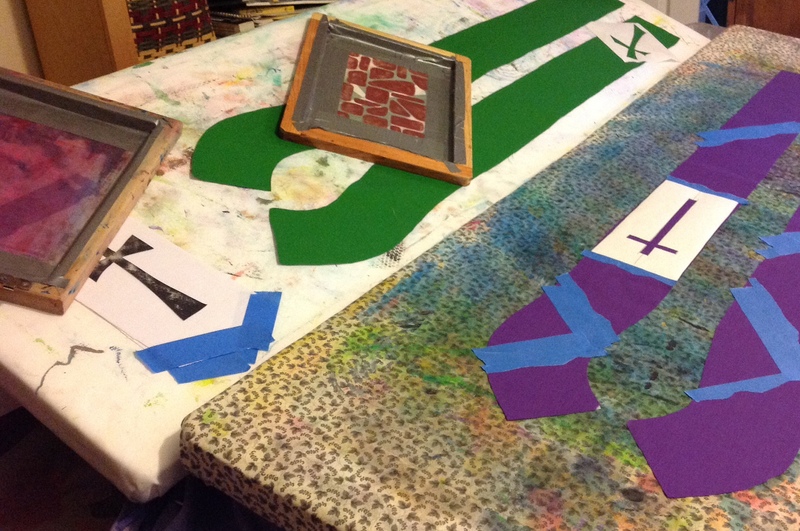 Stencils, screen prints, and simple masking are all put to use. 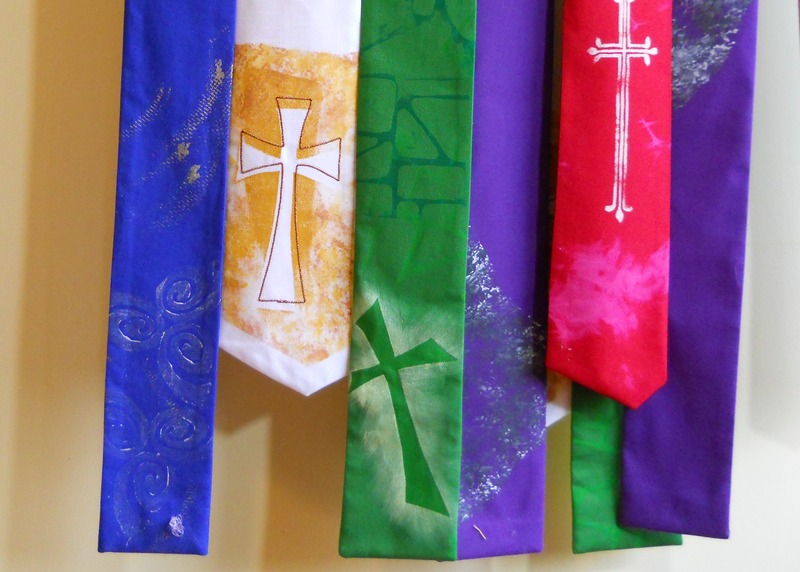 The second photograph show the five stoles after the paint dried. The next step is to hang them on the design wall for evaluation. Is there enough pattern? Contrast? My daughter and shop partner challenged me to have six stoles priced at $75 in our Etsy shop, fibergig, by October 15. I do not want to disappoint her. 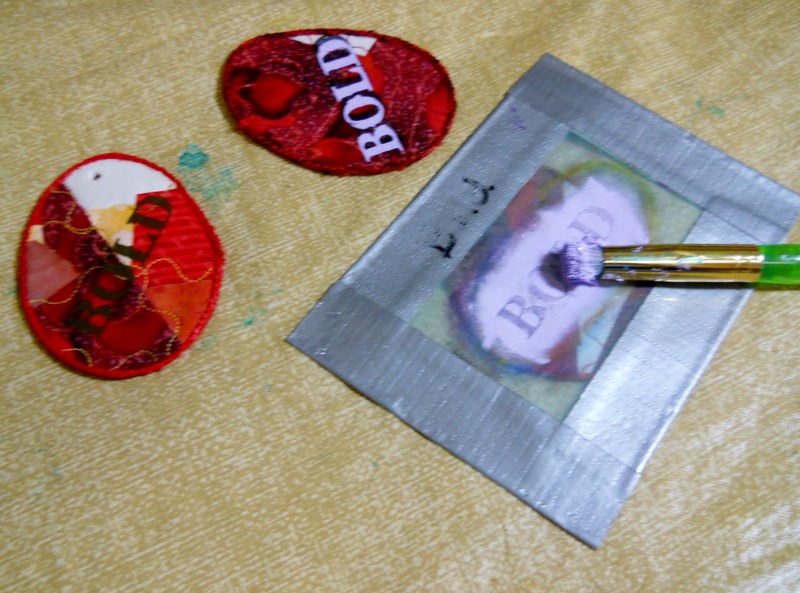 This week’s studio work includes using products from one of our fellow Etsy shops, PG Fiber2Art. They market thermofax screens which are great for applying painted design to paper or fabric. 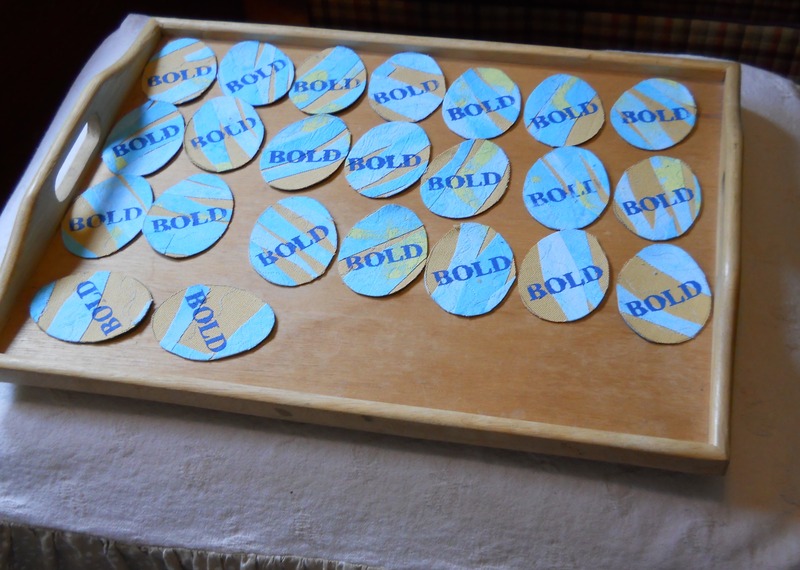 We had the BOLD made for our new fiber tags. 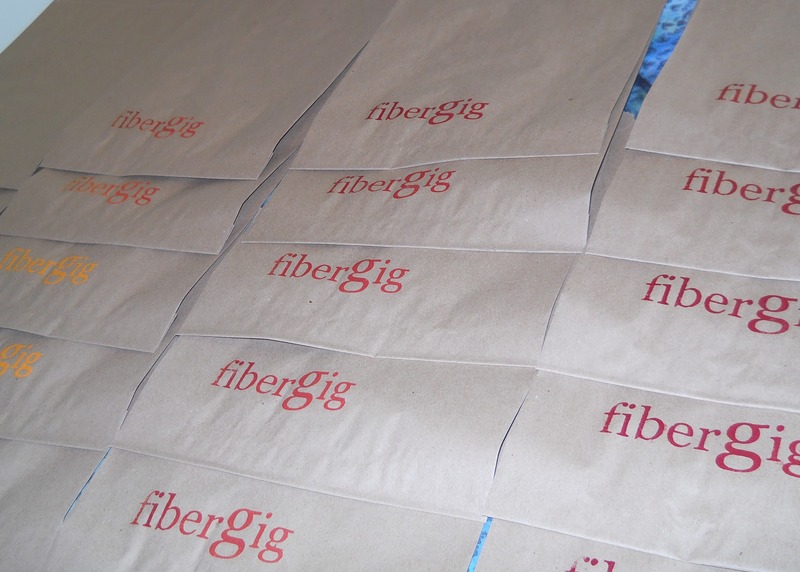 We ordered our fibergig name in two sizes, one for bags and one for garment labels. Please visit their shop. You will be inspired. What Makes a Good Apron? 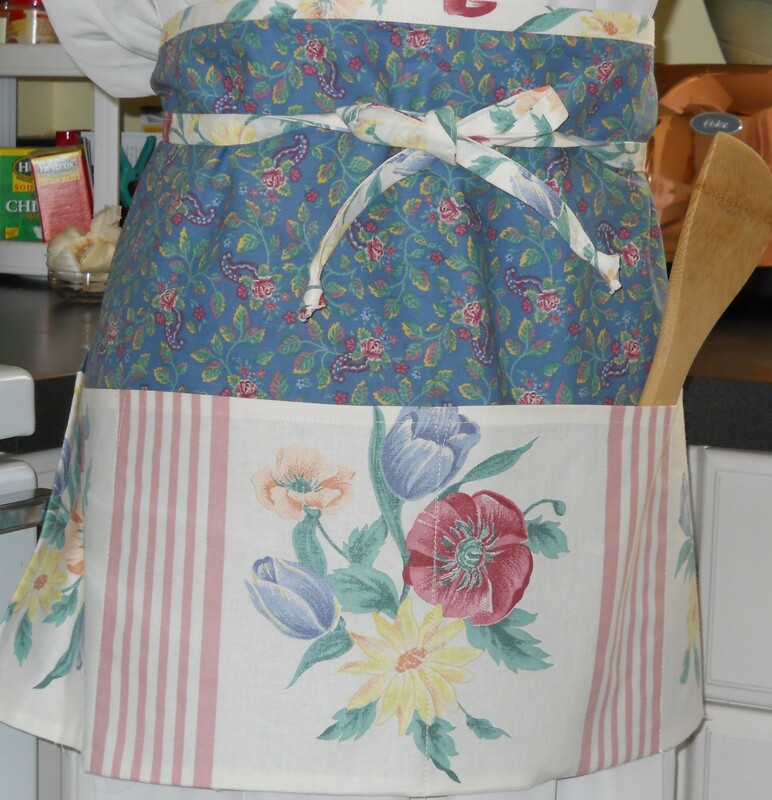 Do you choose a full apron made of a cheerful print with good pockets? Do you prefer this half apron made of upcycled fabric, with extra long ties and good pockets? Do you want an apron like mine, an apron much-loved through use? Do you need an apron that is just right for you? Bill wants a full apron with good pockets and extra long ties that go around and meet in the middle. He does not like to tie an apron behind him. Bill is a baker; he needs a serviceable apron. He asked me if I would make one for him. I am. Aprons are available at fibergig; click the icon to see the shop. Please convo us about custom orders. I agreed to play within those parameters and present several possibilities. The original pillow is in the lower right of the photograph. 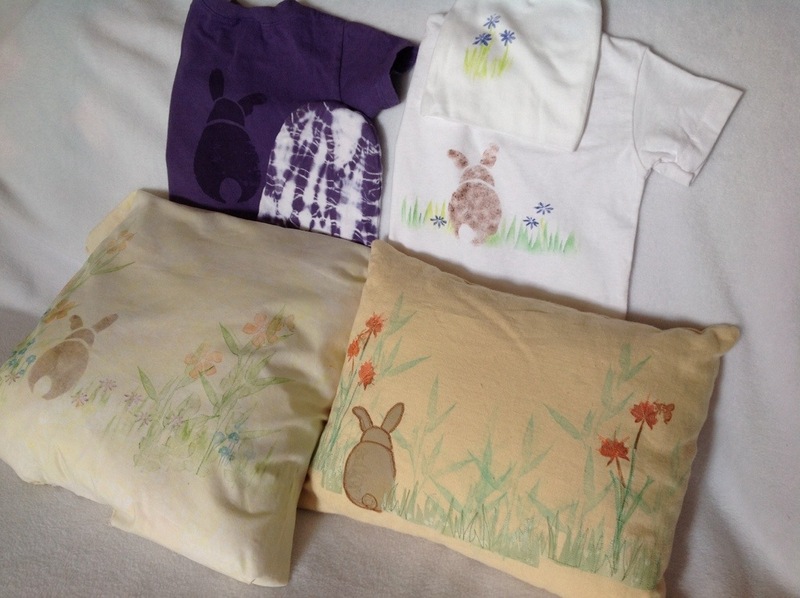 A cotton pillow front with printed pattern is on the left. I made two more similar to this. While I was on the bunny trail, I painted a white onesie and hat featuring our sweet bunny with spring blooms. I also took a more contemporary approach with a larger bunny and purple dye, paired with a tie dye hat. Sarah will decide if my efforts match her needs; we agreed that she would be under no obligation. The rest of the items will be in this shop soon. I like to cooperate with the weather instead of resisting it. It’s the farm girl in me. It’s the sensible mom in me. It’s the “be present” mystic in me. Snow and frigid cold is a gift of time for design and prototype development in the studio this week. Fingerless gloves knit by my daughter Emily keep my fingers warm. I want her to knit more of these for our fibergig shop next winter. Do you think bright-colored wool is a good addition to a snowy day? Hit the refresh button and head to comfort zone! 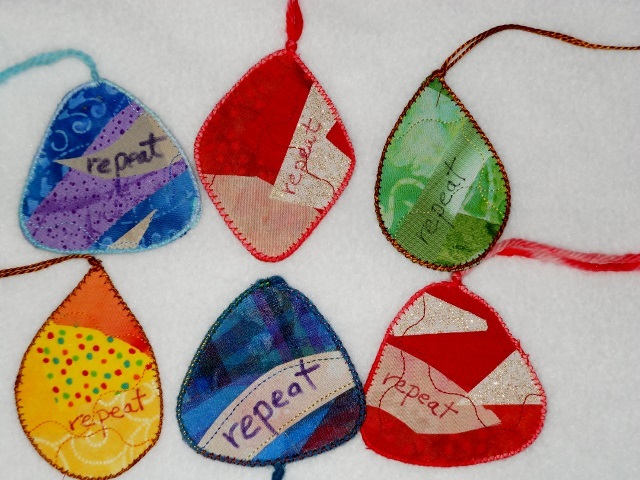 Mid-week there was a great amount of reverse stitching (also known as ripping) in the studio. Neither design nor construction technique was working. 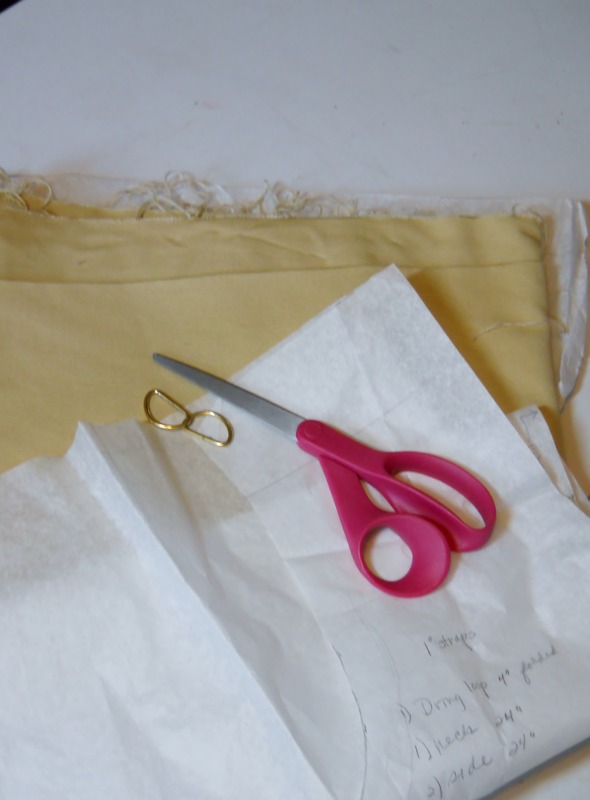 When I rip many stitches one of two things happen: either I repeat the sewing step with more care, a different thread, a new machine setting, or I have an aha moment to a new approach. Thursday I picked up some of Emily’s hand dyed yarn, which is available at our fibergig shop on Etsy, and began to couch it to the chasuble. I love to couch yarn, and using Emily’s is true joy. I am on a path to completion. The fun part of selling do-its in person is asking folks what verb they would choose to put on one. A few weeks ago I watched a gentleman carefully pick out dance, begin, create. “What would you like to see on a do-it?” I asked. “Repeat,” he responded quickly. “Repeat? May I ask what you do for a living?” I was surprised by his verb. It was one that had never occurred to me to use. What a beautiful gift of a word he gave me! I have been pondering it. I see how important it is to my studio work. Repeated techniques. Repeated motifs. I recall my joy of seasonal life, a repeat I share with community. So I put the word repeat on a do-it. And repeated it a few more times. These are being shipped to a good teacher. More will become part of the shop inventory for fibergig at Etsy. One will hang in Studio Three 17. A do-it is a small tag made of fabric, thread and yarn. 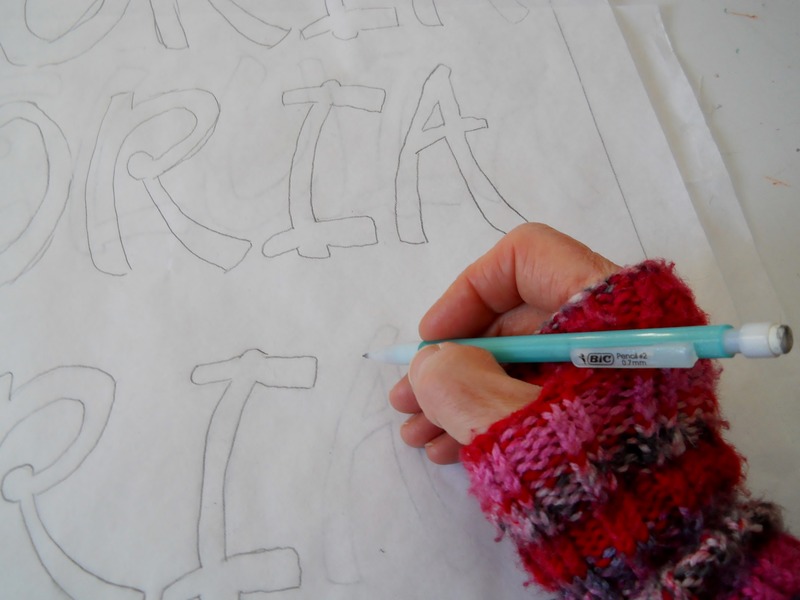 It serves as a whimsical reminder of a desired action, which is handwritten with fabric pens. What verb would you like on a do- it? 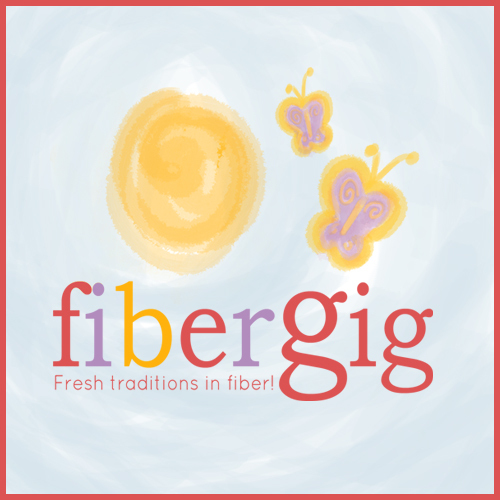 Fibergig, the Etsy shop I operate with my daughter Emily, is participating in Christmas in July with the Handmade Circle. My hands are busy with projects out of sync with the weather; my mind actively wanders over its own terrain. Why do I so enjoy making things for the holidays? I get great delight in making art and artifacts every day, but there is a peculiar joy in what I do for the winter holidays. When I was younger, much younger, my holiday greetings focused on peace and good will. Over the years, there has been a shift to comfort and joy. Even when the family Christmas tree became a winter solstice tree to accommodate a larger scope of belief, the ornaments were about nestling birds and dancing stars. Comfort and joy. That is what I like to share, particularly during the winter holidays. And I often express it through items made by hand. How do you like to share comfort and joy? 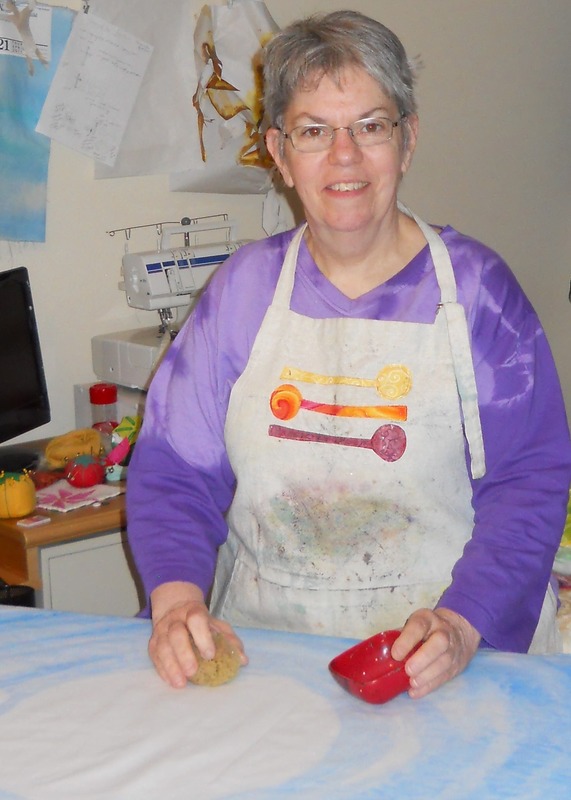 Norma publishes periodic e-newsletters to share what's happening at Studio Three 17. Click here to subscribe. Enter your email address to follow the Studio Three 17 blog and receive notifications of new posts by email. “You’ve been accepted.” Now box it. © Norma Fredrickson and Studio Three 17, 2012-2017. Unauthorized use and/or duplication of this material without express and written permission from this blog’s author and/or owner is strictly prohibited. Excerpts and links may be used, provided that full and clear credit is given to Norma Fredrickson and Studio Three 17 with appropriate and specific direction to the original content.